This walk: 2012-4-25. Meldon Reservoir, commemorative plaque, trig. points (survey stations), dam, Longstone Hill, Sourton Tors, Meldon Viaduct, Red-a-ven Brook, Black Hill, quartz veins, lichen, aplite quarry, Red-a-Ven Copper Mine, Devon Copper Mine, Blackdown Copper Mine, Okehampton Wheal Maria, Meldon Mine, weighbridge, finger tip dumps, wheelpit, West Okement River, Meldon Pool, beech trees. This was a very wet day - the irregular white 'blobs' on some photos are raindrops on the camera lens - brave photographer! Link to Google Satellite view of the area. It was inaugurated in 1972 - it is the 40th anniversary this year. Click on the image to see a larger version (you can navigate around it using the four cursor arrows). Apparently, these setts were imported from Portugal ..... (some guides know everything!). Actually, modern granite setts are imported from China, Portugal and Brazil (Source: Dartmoor News, Issue 126, May/June 2012, p. 24). A kind of trig point or surveying station erected when the dam was being built, to help the engineers get the curve right. There is one at each end of the dam. View of the dam from the north-west (car park) end. Longstone Hill in the background. Is a caption necessary? Okay then, it was raining! The trig point / pillar at the other end of the dam. Looking back across the dam, after crossing it. The top of the pillar, the engineers must have put a gadget (theodolite?) here. Another view of the dam under official drought conditions! Looking down the Meldon valley and West Okement River to the Meldon Viaduct. "Meldon Viaduct, a Scheduled Ancient Monument, is a superb example of Victorian Engineering and is one of only two in the country of this type of construction. Built in 1874 for the London and South Western Railway main line between Waterloo and Plymouth, it was widened to double track in 1878 and closed to trains in the late 1960s. The widening was achieved by constructing a second viaduct along side the first, using an almost exact copy of the original design. Over the years the two structures have been tied together in an effort to reduce sway when trains crossed the viaduct. The structure underwent a major refurbishment in 1996. Although the trains have long gone it is still a significant landscape feature that it is now available to walkers and cyclists." Meldon Reservoir well and truly overflowing after the recently announced official drought! Lichen tree - probably Usnea articulata or string-of-sausages lichen. We were told it thrives here because the air is so much purer in this part of the moor!! Another dam view ..... see the water coming down in sheets? Looking up the length of Meldon Reservoir from the near the dam with Sourton Tors in the background. ................. and the sun shone on the righteous! Looking up a tributary of Red-a-ven Brook with Black Hill in the distance. I'm so glad we're over here because it looks a little wet over there! View up the Red-a-ven on this watery day. The tributary again, and Black Hill with military huts (on hilltop). Part of Red-a-Ven Copper Mine, Okehampton Wheal Maria, Blackdown Copper Mine, Meldon Mine or Devon Copper Mine (alternative names for the same mine, see the link - which says that the experts do not agree as to where some of the names were applicable?). There is an area of dressing floor to the left. Wheelpit - centre of photo beside the brook. The water from this leat was used to wash down the rocks after blasting allowing the rock-drillers to follow the veins in the "clean" rock-face. Again, the Red-a-ven. The name is from Red Vein, relating to the veins of red rock in the brook. The Aplite Quarry - an SSSI (a site of Special Scientific Interest), producing a mineral-rich silicate material that was important for glass-blowing. All that remains of the weighbridge dial that was used by ECC (East China Clay Co.) when breeze blocks were manufactured here during the 1970's to 1980's. Something to do with the glass blowing / aplite / breeze block enterprises. The last fish I caught ......... okay then, indicating where the sluice of the reservoir we were standing in used to be. Finger tip dumps of waste from the limestone processing. Wheelpit and bridge over the West Okement. Meldon Pool, the now flooded limestone quarry, at SX 564 922. A beech tree wall - which came first, the trees or the wall? Artistic impression of the row of beeches. 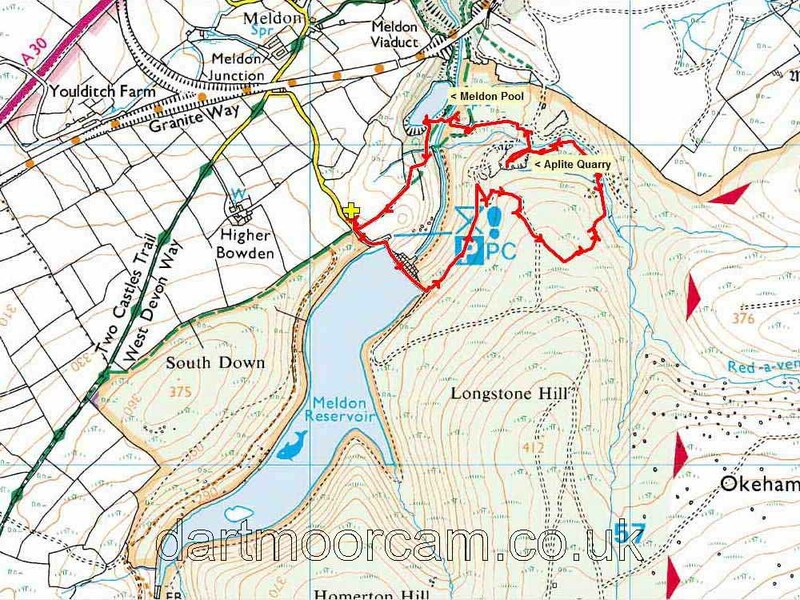 This walk was reached by tirning off the A30 dual carriageway near Okehampton, following the signs (from the west) for Okehampton, Meldon and Meldon Reservoir, with parking at the yellow cross / P symbol on the map. Distance - 3.27 km / 2.03 miles.